Photopass is what Walt Disney World calls their photographers and the photos that have been taken by these photographers. Photopass Photographers may be found throughout all four of the theme parks as well as some character dining locations at the resorts. Stop by any location with a Photopass Photographer, they have a distinct uniform that they wear. The photographer will take your picture, for FREE. Then after the picture is taken they will scan either your MagicBand or your park ticket. Very simple! In some locations, such as Jedi Training, Jack Sparrow's Pirate Tutorial, Enchanted Tales With Belle and Bibbidi Bobbidi Boutique, the Photopass Photographer will hand you a card after the event is over. There is a section on the Photopass website to add the number on the back of the card, once you sign in click on Add A Photopass Card. After the ride there will be tv screens with the pictures, under your picture, touch the Mickey head on your MagicBand to the Mickey head on the scanner. This will link the picture to your Photopass account, again absolutely FREE. You only pay if you want to purchase the photos. After your vacation go to the photopass website, https://mydisneyphotopass.disney.go.com/ or the My Disney Experience App. You will choose which Disney theme park you visited, then you may view and purchase your pictures. A standard picture may be purchased for $15.00/each. Memory Maker is a product that allows guests to purchase the all of the photos taken by the Photopass Photographers and all of the ride and dining photos for one price. Pre purchase Memory Maker before your vacation $149. If you decide to purchase Memory Maker during or after your vacation the cost is $169. I recommend pre purchasing Memory Maker at least a week in advance because pictures taken within 3 days of the date of purchase will not be included in Memory Maker and must be purchased separately. If you purchase Memory Maker in the parks, you may have to link Memory Maker to your Disney account. If you have pre purchased Memory Maker, once your vacation begins you may start having your picture taken. You do not have to do anything, no linking, nothing. As long as you purchased it more than 4 days in advance you are all set. After you have purchased Memory Maker you may begin downloading your pictures as soon as they become available in your account. I recommend waiting until you get home, it will be easier on a computer. By purchasing Memory Maker you have 30 days for pictures. PhotoPass photos currently expire 45 days from the date the photo was taken. If your pictures do not show up in your Disney account, you may contact the PhotoPass Guest Support by calling (407) 560-4300. Memory Maker is a digital-only entitlement. You can visit the PhotoPass website to purchase prints, gifts and other products using your PhotoPass photos. I love to purchase the CD, which contains all of my pictures as well as stock photos. Planning a vacation to Walt Disney World can be confusing, stressful, time consuming and very, very frustrating. A fantastic solution is to use a Disney travel planner. What is Disney Travel Planner? A Disney Travel Planner is a travel agent who specializes in everything Disney. A Disney Travel Planner can not be called a Disney Travel Agent because while we work with Disney, we do not work for Disney. Why can't I just plan my vacation myself? Planning a vacation to Walt Disney World, Disneyland and the Disney Cruise Line can be confusing, time saving and frustrating. A Disney Travel Planner will know the ins and outs of planning, organizing a Disney vacation. As well as ensure that you and your family will have a magical vacation to the happiest place on Earth. What are the perks to using a Disney Travel Planner? I will book your resort reservations and make sure you will receive the accomendations you deserve. You won't have to worry about online check in and room recommendations. Should you purchase the park hopper? How many days should you spend in the parks? Should you have relaxing at the resort days? I can answer all these questions and many more. No worries about reserving Magical Express or renting a car. A Disney Travel Planner can recommend wonderful restaurants for every member of your party. Also I will happily make your dining reservations, at 6am est, and I will even be able to snag those hard to get reservations. FastPass reservations have to be made very early in the morning. I love making them. A Disney Travel Planner can also recommend which rides/attractions to FastPass. Not all of them need one. One of the perks of using me as your Disney Travel Planner, I can recommend and even make your stroller/scooter reservations. So the stroller/scooter will be waiting for you at your resort. By using me as your Disney Travel Planner, I will provide an itinerary, not only listing everything from number 7 but also a guide to help you avoid the long lines and crowds. 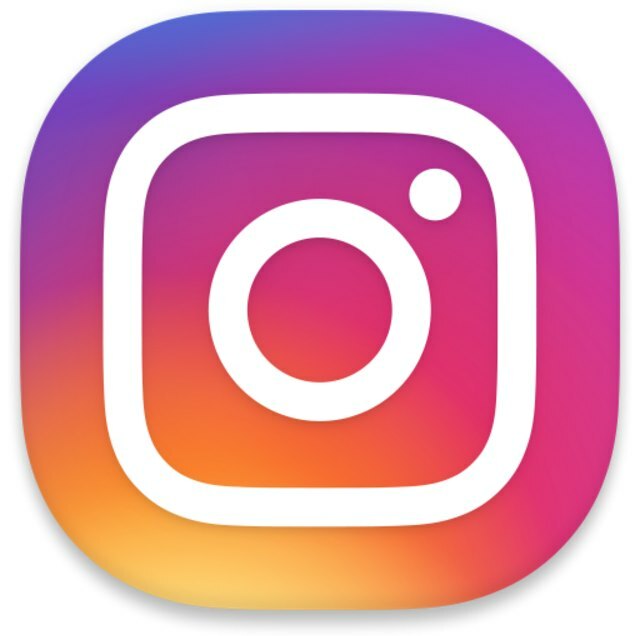 The intinerary is easy to access from your phone. By only contacting one person, the Disney Travel Planner, it will save you time and the hassle of getting the run around. By using a Disney Travel Planner, you won't have to worry about watching for future discounts, the travel planner will keep their eye out and contact Disney to apply the discount, saving you money. Disney provides extra magic throughout its theme parks and resorts, a Disney Travel Planner would know how to apply them to your party. My Disney Travel Planner services are free for my clients, so you receive concierge service at NO COST TO YOU!! ** Are you staying on-site (on Walt Disney World property) or off-site? ** Will you be purchasing a package (hotel, tickets and dining) or will you be purchasing everything seperately? **** How to figure out which park to visit on which day? **** Will you be using Extra Magic Hours (if staying on-site)? **** Which park rides and attractions appeal to your family? your food then wait for the food to be served.) restaurants only? to eat. Also if your family can eat earlier than 5:15pm and later than 6:15pm then the lines will be smaller. ********** Another question to be asked is will you have the Dining Plan? ************** NO, then you may need to look at meal prices to determine expenses. ****** So now sit back and relax and read some restaurant menus to determine which restaurants your family will enjoy. Is it a pain in the haha now? Yes but when you snag that pre-park opening breakfast and get to walk down a nearly empty Main Street or your child is able to eat dinner with the Princesses in Cinderella&apos;s Castle, it is all worth it. You will also have the relief that you will not be standing in a park at six o&apos;clock with a screaming kid, trying to figure out where to eat. Then when choosing a restaurant to only find out they are booked up. It does happen. During more than one trip, as my family is waiting to be seated, we have witnessed a family trying to get into the restaurant, only to be turned away. **** After the 3 fastpasses have be used you can visit a FP+ kiosk (even in a different park) and make another fastpass. When that one is used, you can make another reservation and so on and so on. ** If you stay on-site you can make your fastpass reservation 60 days before the first day of your trip, at 12:00am est. Like dining reservations you can make these reservations for your whole trip. ** If you think you will not need them, make the fastpasses anyway. There is no penalty. ** When booking your fastpasses start with the hardest to get first, Anna & Elsa, Seven Dwarfs Mine Train. **** If you are unable to book the fastpasses you want, check again 30 days before your trip, fastpasses may open up. ** If you are staying off-site you can make your fastpass reservations 30 days before everyday of your trip, at 12:00am est. *Magical Express is a complimentary bus service that is available for Walt Disney World guests arriving at the Orlando International Airport between 5:00am to 10:00pm. *Magical Express is located at SIDE B LEVEL 1. *If you book your flight before your hotel then you are able to add your flight information for Magical Express when you book your Walt Disney World vacation, either online or by phone. 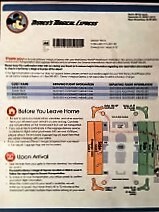 *If you book your flight after you book your vacation then you can add your flight information to your Walt Disney World reservation, for Magical Express, by call 1-866-599-0951 or WDW Magical Express Online Reservations *Approximately two weeks before your vacation you will receive, in the mail, long yellow tags for your luggage and a confirmation letter. You will receive a yellow tag for every person, including children, on your Disney reservation. *If you choose to use the yellow tags, you attach one to every piece of luggage you are checking at the airport. 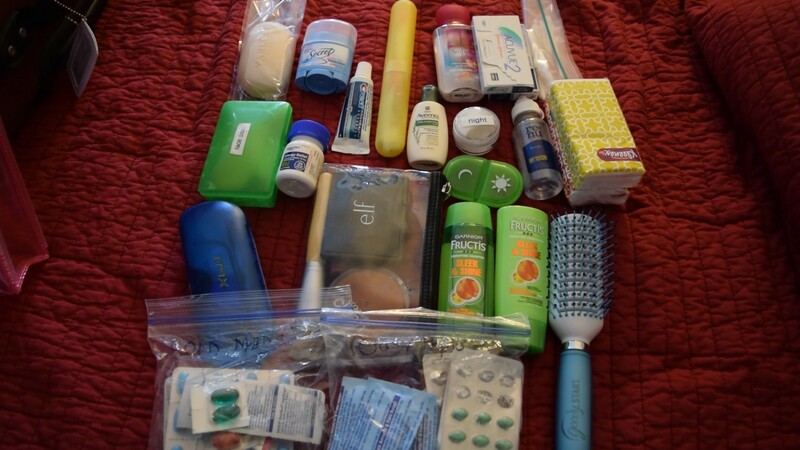 Once you check your luggage at your home airport, that is it. You do not pick it up at the Orlando International Airport, Disney handles that task. Then your luggage will be delivered to your hotel room approximately three hours after your flight has landed. *If you DO NOT us the yellow tags, you can still use Magical Express. You will have to pick up your luggage at the airport. Then bring the luggage to Magical Express, the driver will load it under the bus. *You may have to wait a little bit for the bus. Once the bus is loaded it may stop at other resorts before yours. While on the bus you will enjoy an Introduction to Walt Disney World video, as well as Disney cartoons. 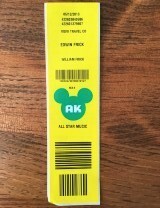 A base park ticket will allow you entrance to one theme park per day. The price of tickets dramatically drops when you purchase five days or more. Tickets must be used within 14 days after first use. By adding the park hopper option you will be able to visit more than one park per day. The park hopper is one price for your entire trip. If you purchase tickets for four days or eight days the price is the same. Water park and more allows you access to Typhoon Lagoon, Blizzard Beach, ESPN Sports Complex, Summerland Miniature Golf, Fantasia Gardens Miniature Golf and Oak Trail Golf Course. If you purchase a four day base ticket and add the water park and more option you will receive four days of water park and more tickets. So for those four days you may visit one of the following, Typhoon Lagoon, Blizzard Beach, ESPN Sports Complex, Summerland Miniature Golf (prior to 4:00pm), Fantasia Gardens Miniature Golf (prior to 4:00pm) or Oak Trail Golf Course. Choose a sunscreen that is high in spf. 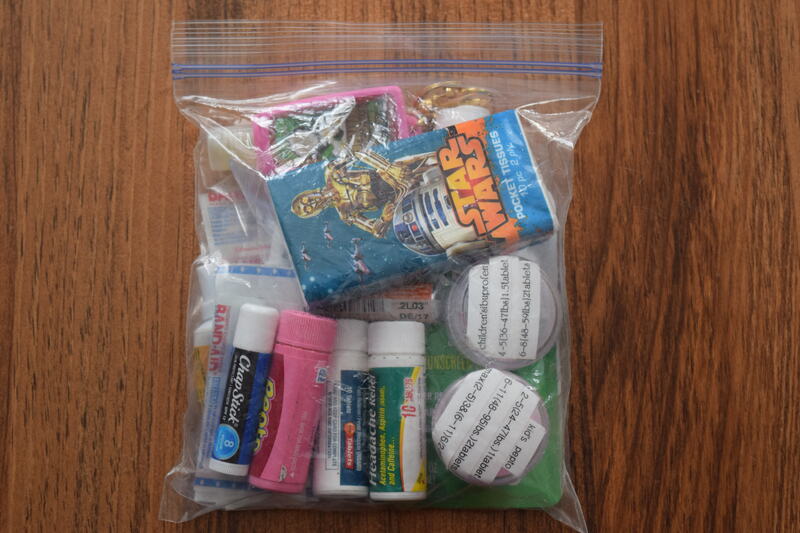 I pack sunscreen in the tolietrie bag for the park days. On our travel days I pack a 3 oz. 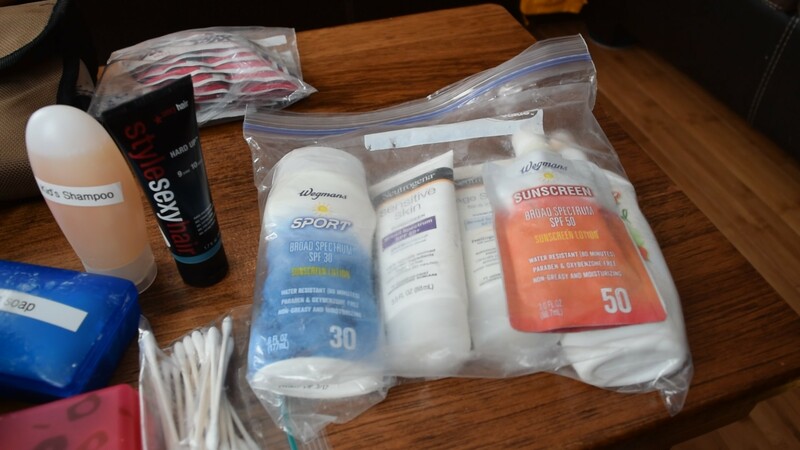 sunscreen in the quart bag. This sunscreen is also packed in the park bag. 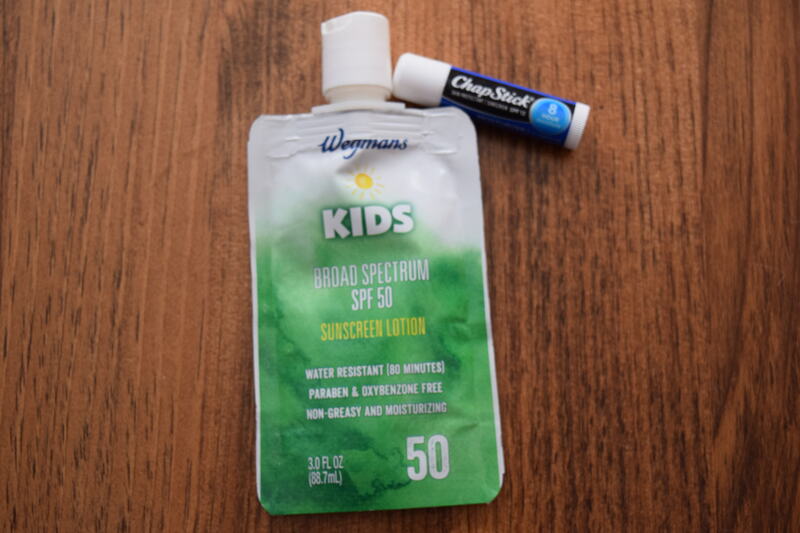 I love the Wegman's brand or Coppertone sunscreen for travel. 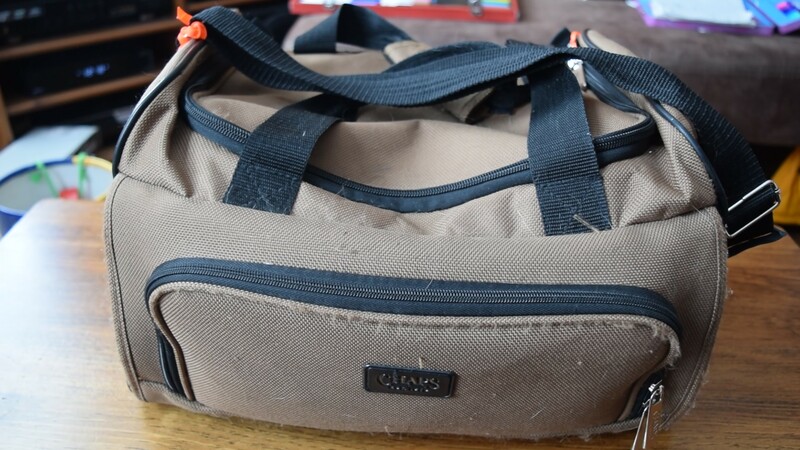 The Wegman's brand fits very nicely into the quart bag. 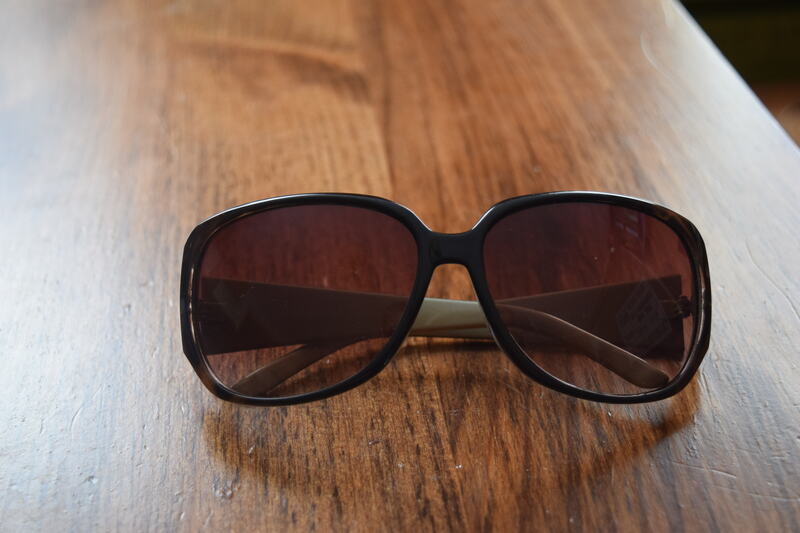 Sunglasses are a must, the sun can be very bright and brutal during the day. A great camera/video camera will help capture all of your memories. 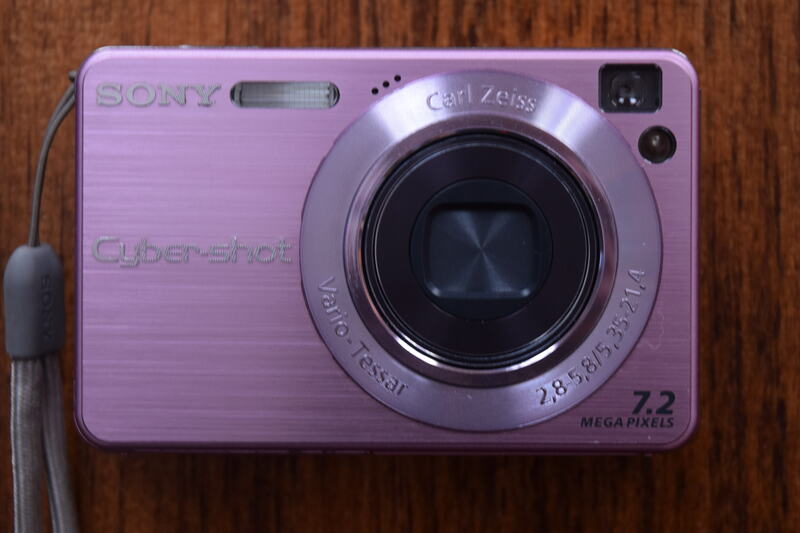 In the past I have owned a Sony Cybershot. 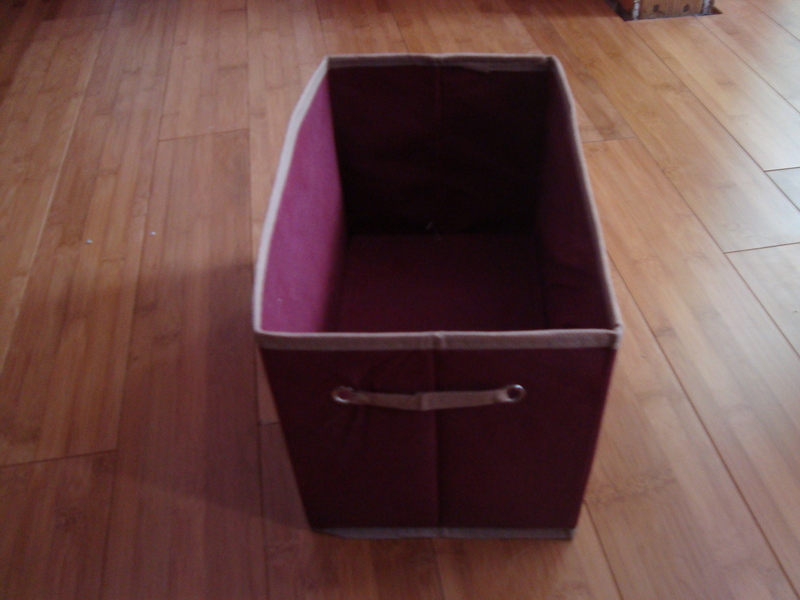 It was the perfect size and did an excellent job at taking pictures. Now I own a bigger, more technology advanced camera, Nikon 3300, this camera is amazing for action shots. 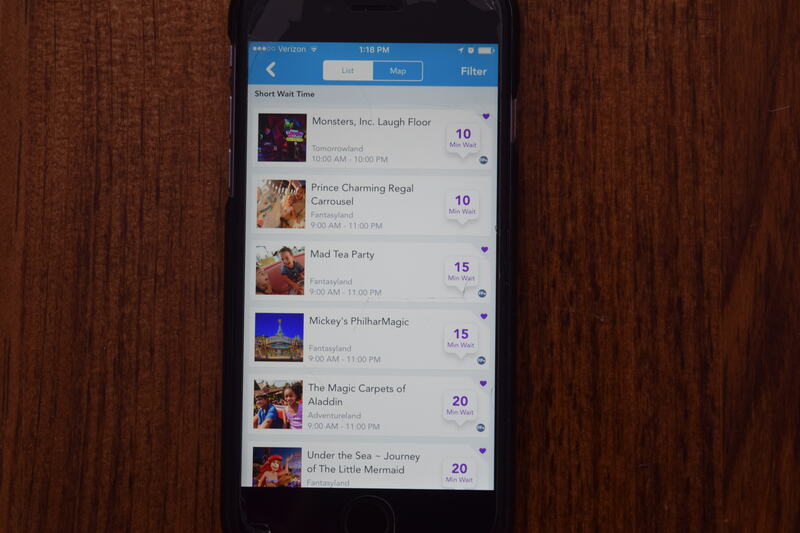 With the My Disney Experience app, a cell phone is a great park must have. Within the app is the wait times sections, you will be able to find out the wait times of the rides/attractions in the parks. Less time to wait in line, more time to enjoy with our family. 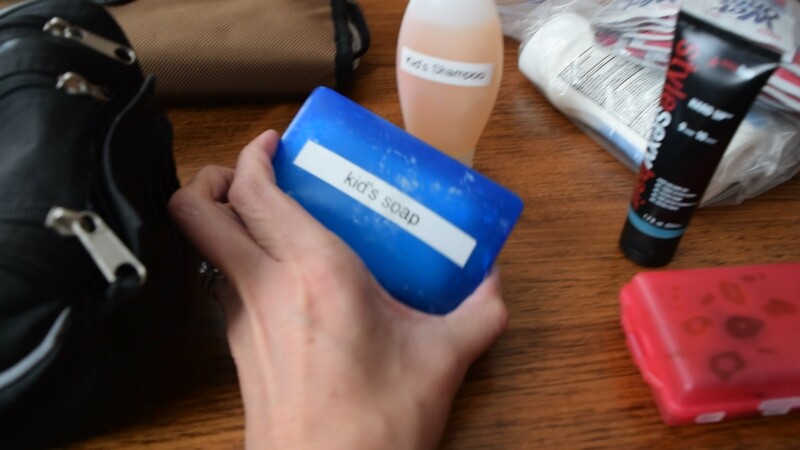 Hand sanitizer is a good way to clean your hands on the go, after rides, meeting characters and after the restroom. 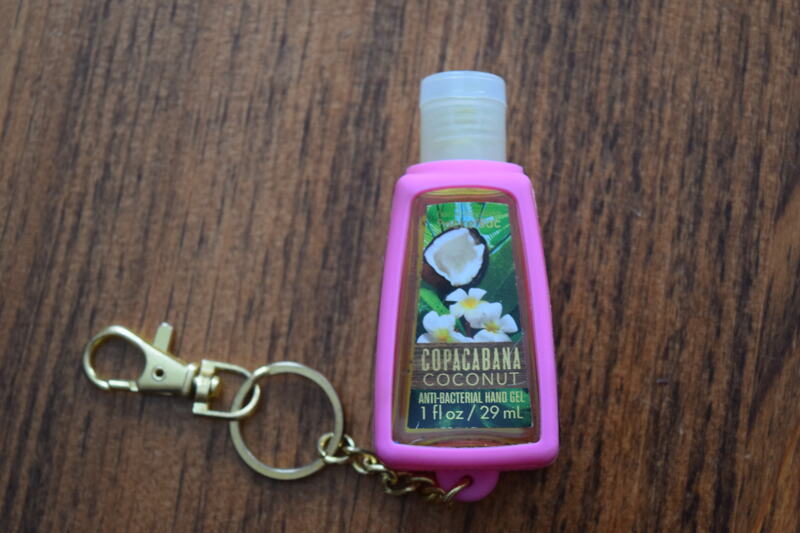 I love the scents of the Bath and Body Works hand sanitizer and the cute little holder that clips right on to the backpack. 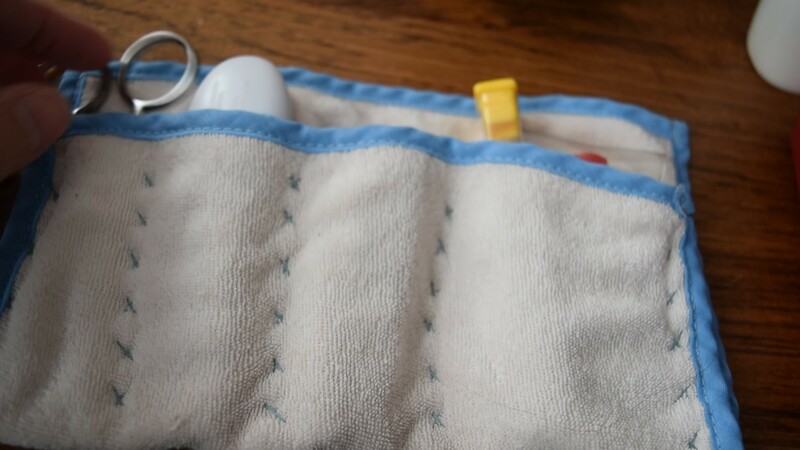 Baby wipes are fantastic to clean up before and after a meal. And in case of a sticky snack, ice cream, popcorn even the wonderful cupcakes. 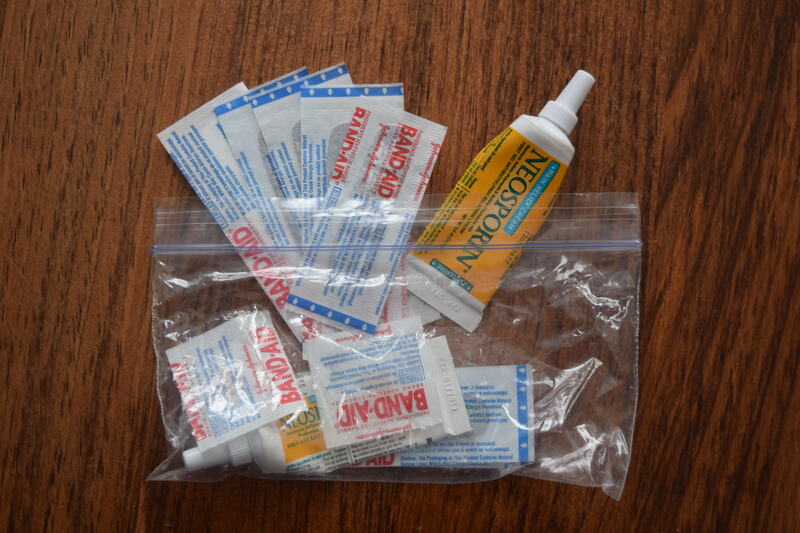 In my travel pharmacy, I have a snack size bag with Neosporin and Band Aids. and antibacterial cream and Band Aids can be expensive on property. 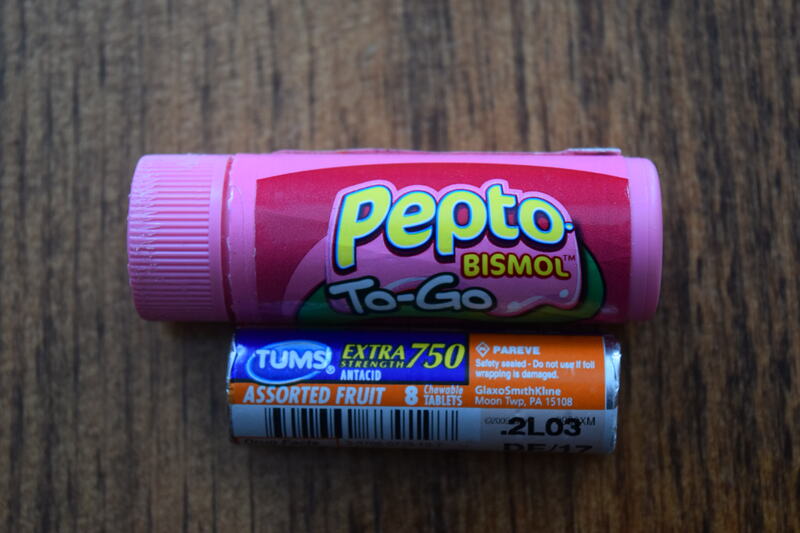 In the quart bag I have a travel container of Pepto and travel Tums for adults. Because I have children I also carry children's Pepto in a small container with a label. 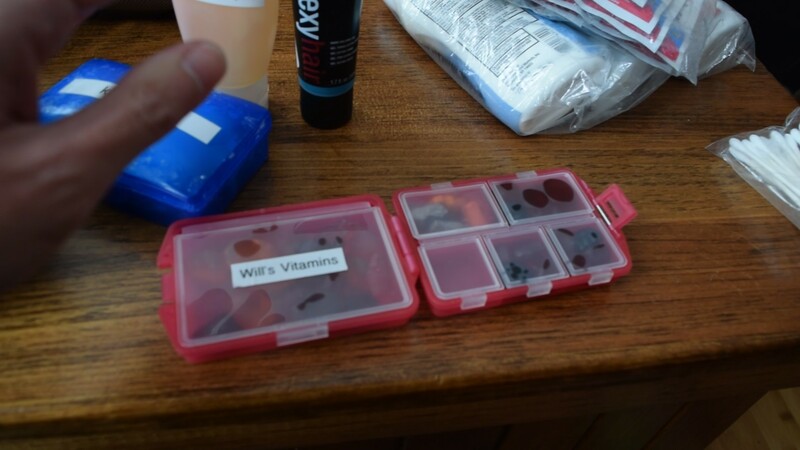 In my travel pharmacy I have a travel size container for ibuprofen and a travel container for aspirin. 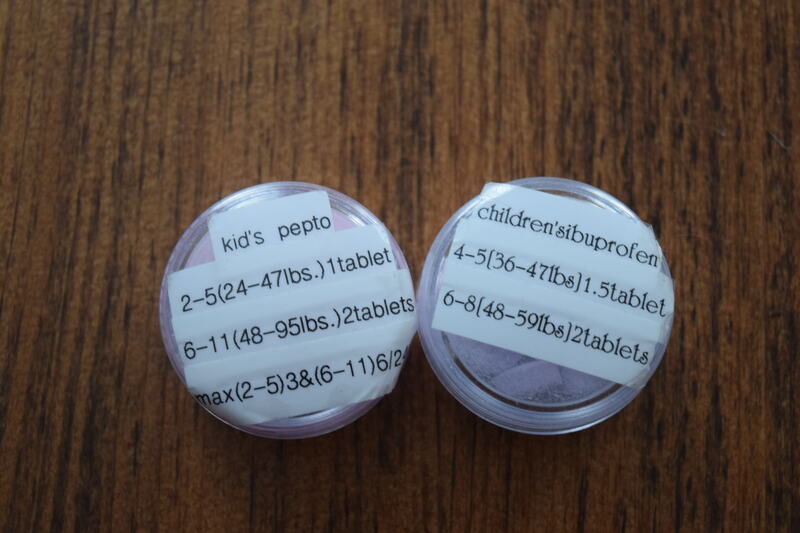 Just like the Pepto, I carry children's ibuprofen in a small labeled container. 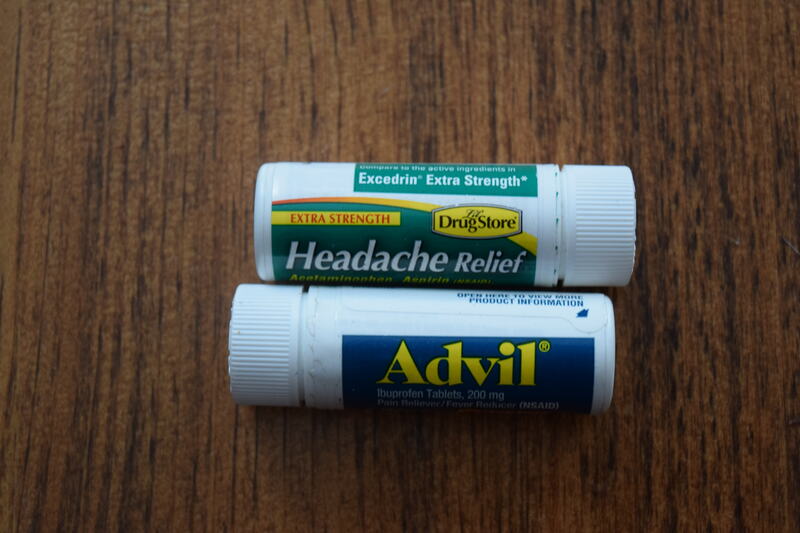 Ibuprofen, aspirin and Pepto can be expensive on property. 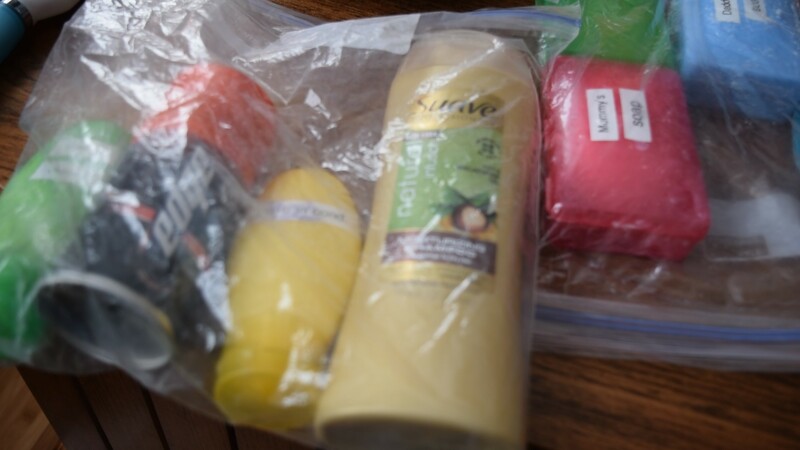 I always bring a full size bottle of each in the tolietrie bag then replenish the travel containers. 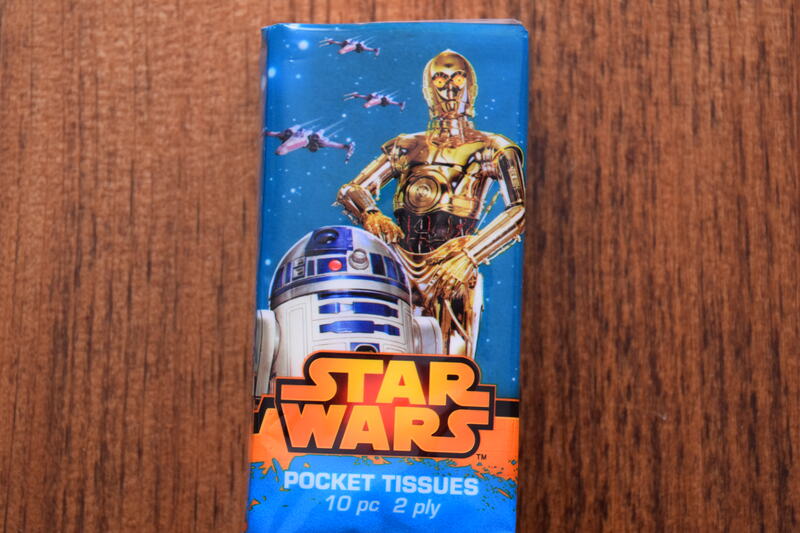 A travel pack of tissues is always great to have on hand just in case. and the bag is sealed for the water rides, examples Splash Mountain and Kali River Rapids. I will pack a raincoat for each member of my family. The coats fold into their own pocket to take up less room. which has happened on more than one trip in May, the coats stay in the hotel room. 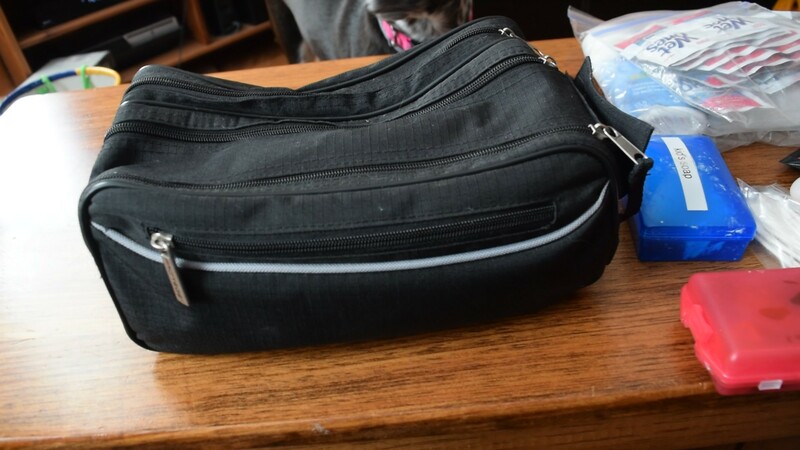 In this picture I have included my everyday wallet and my travel wallet. I decrease the amount of stuff in my wallet substantially. Typically I carry a large wallet so when I travel I only bring the necessities. My travel wallet is a coin purse. 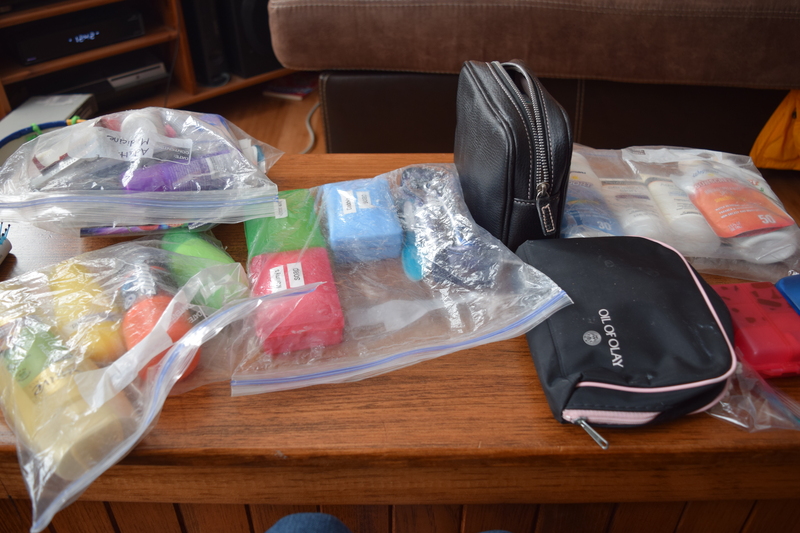 Everything fits nice and neat into the quart bag, making it easy for the airport and the backpack. I love receiving mail, it takes me back to before everything was email and you actually became excited when the mailman stopped by your house. 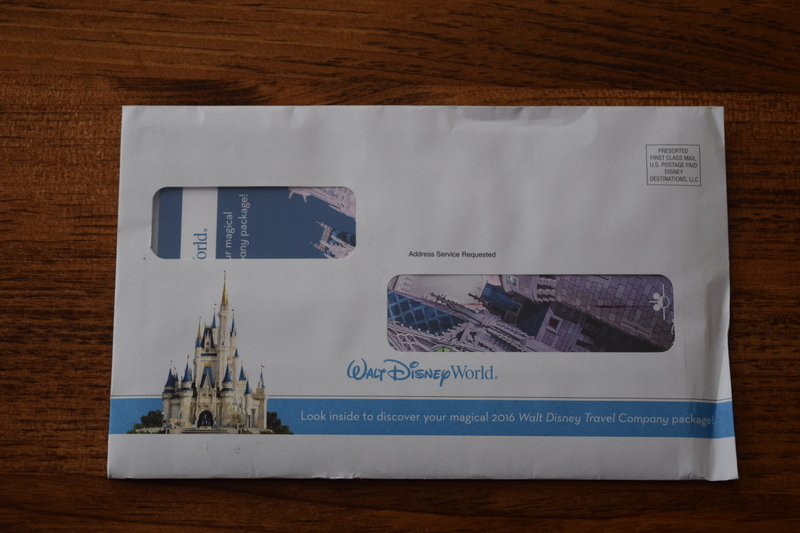 When you book a Walt Disney World resort reservation and package, a bonus is receiving mail from Walt Disney World. The Mickey Mail will be delivered over a course of time. 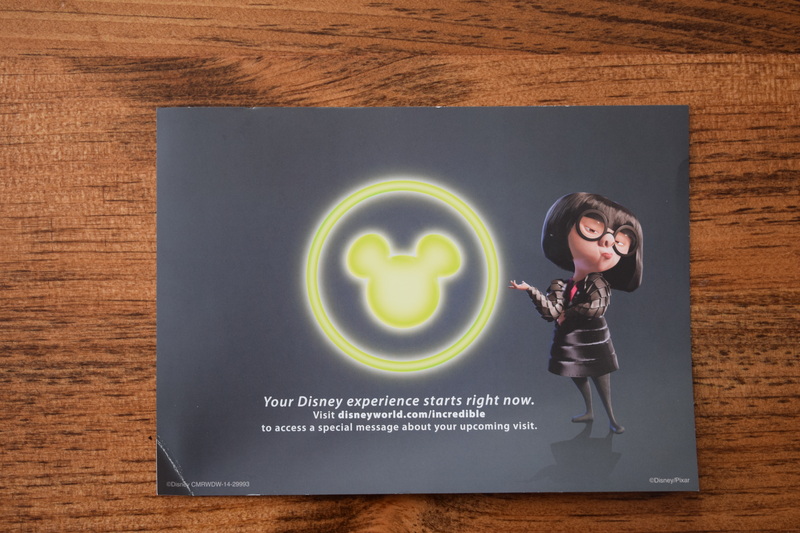 There are four main mailings that you will receive when you or your TA book a Walt Disney World package. The first mailing is themed around the Incredibles. If you have not seen the Incredibles, you must it is a fantastic movie. In the envelope is a booklet and a postcard. On the postcard is information on how you may receive a special message for yor family concerning your upcoming trip. In the booklet, is your reservation at a glance, along with information on My Disney Experience, MagicBands, Fastpass, Your Resort, the four theme parks, Disney Springs, the water parks, if your purchased a dining plan and Memory Maker. On the back of the booklet is a magnet, with important dates for your trip. The magnet is detachable. 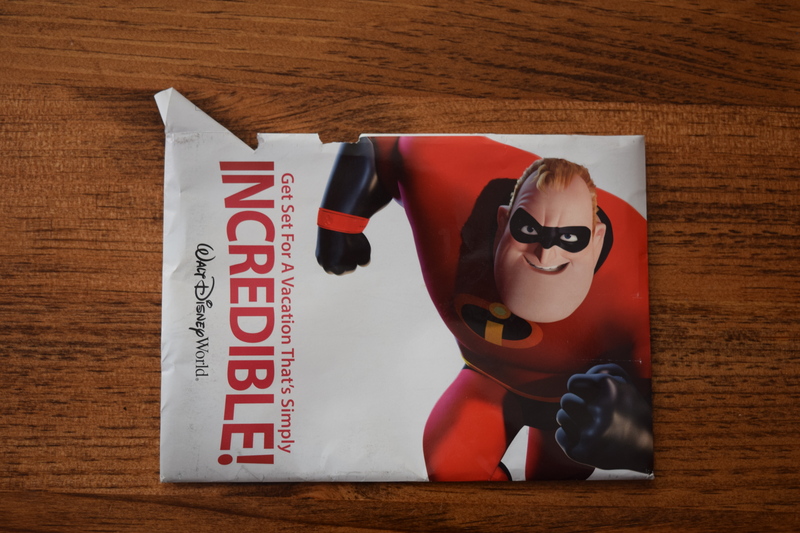 The Incredibles mailing will arrive within two months of booking your trip. The next two mailings may arrive in any order. 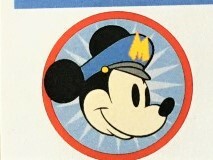 The next piece of Mickey Mail is from Disney's Magical Express. If you are staying on site at a Walt Disney World Resort, you may reserve a spot on the Magical Express. For more information on the Magical Express please read my blog post Magical Express and watch my video on YouTube Magical Express Video. 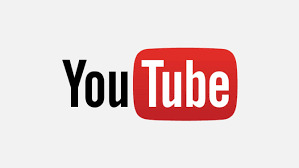 The YouTube video contains more information. In the Magical Express envelope you will find a pamphlet with a lot of information on the Magical Express as well as yellow luggage tags. You should receive one luggage tag for every member for your party unless you are travel solo then you should receive two. 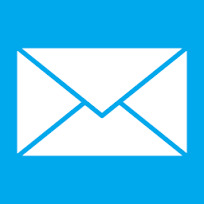 You should receive your Magical Express mail by 3 to 4 weeks prior to your trip. If you do not receive them withing two weeks of your trip please contact Magical Express. As a TA I have the Magical Express information mailed directly to my clients, less stress for the client. 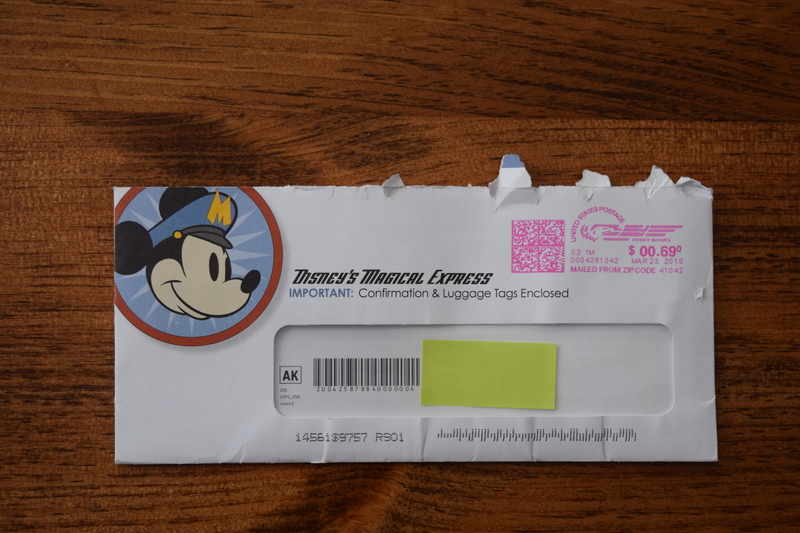 The third piece of Mickey Mail is information on your Walt Disney Travel Company Package. 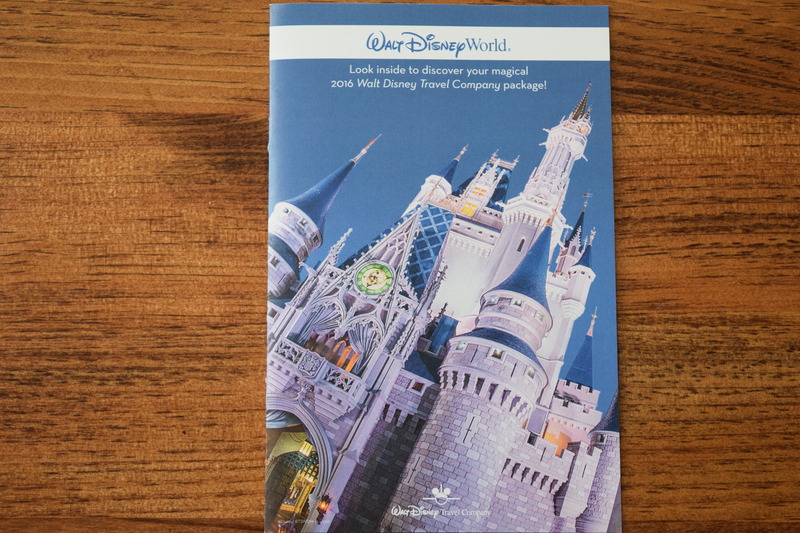 This booklet goes into more detail about your Walt Disney World package than the Incredible booklet. Once again there is information on the My Disney Experience app. 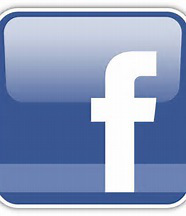 If you have not downloaded it, please do, it is a great tool for your vacation. The booklet also contains information on your resort and Magical Express. The most important part of the booklet is around page four. 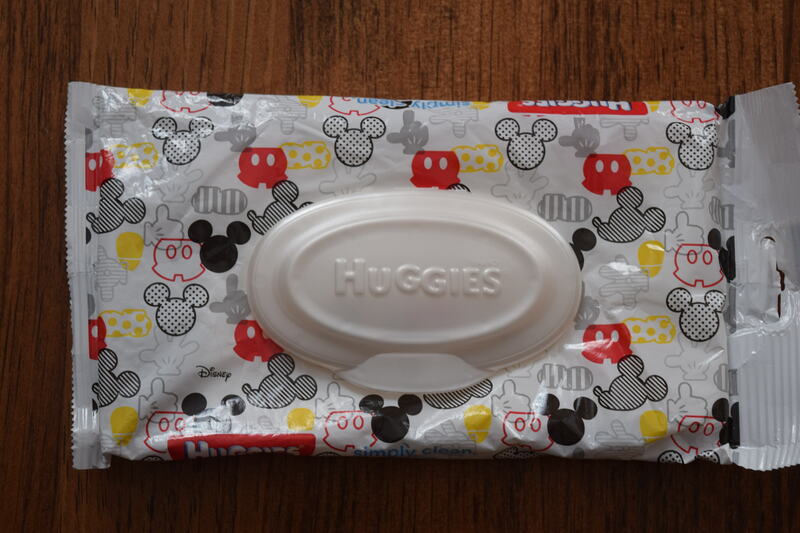 This is where you will find a detailed list of your Walt Disney World package. Starting with your confirmation number, arrival and departure dates, guests names, if you reserved Magical Express, resort room info, ticket info, dining plan info, magical extras, luggage tags info and memory maker information. Like I said more detailed. In the back of the booklet you will find vouchers for Wide World of Sports and mini golf. On the back of the booklet is a punch out card. This card may be used during your vacation for any magical extras. The list of magical extras and discounts is listed in this booklet. This mailing will arrive around 3 to 4 weeks before your vacation. 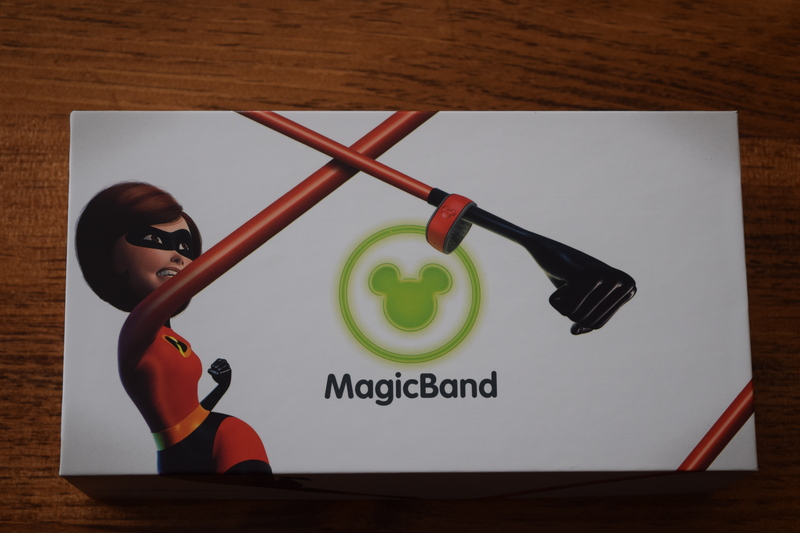 The last piece of Mickey Mail is the most exciting and probably the most important, MAGICBANDS!!!!! MagicBand day is a holiday in some households. Stalking the mailman, edge of your seat, feels like Christmas kind of day. 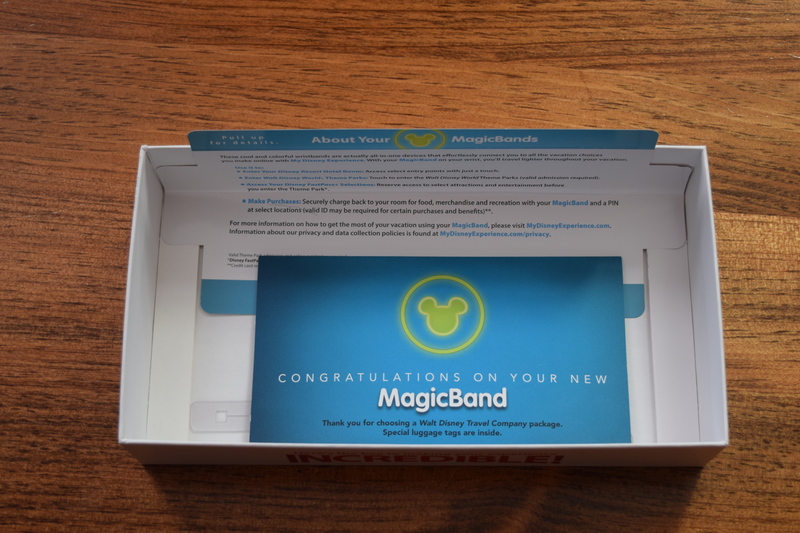 The MagicBands arrive in a box approximately 3 weeks prior to your vacation. 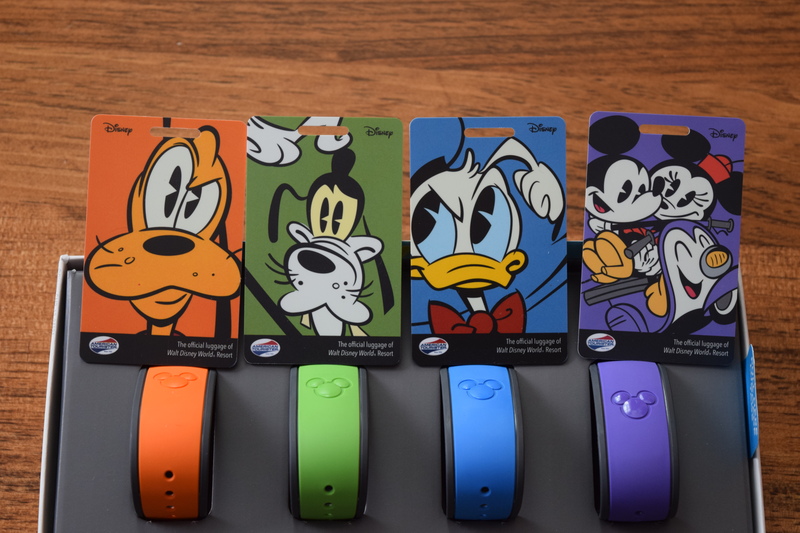 A MagicBand is worn around your wrist and functions as your room key, park ticket, how to use dining credits at restaurants and snack carts, fastpasses, memory maker (photpass) and to board Magical Express. You can also scan the band and charge to your room any purchases. 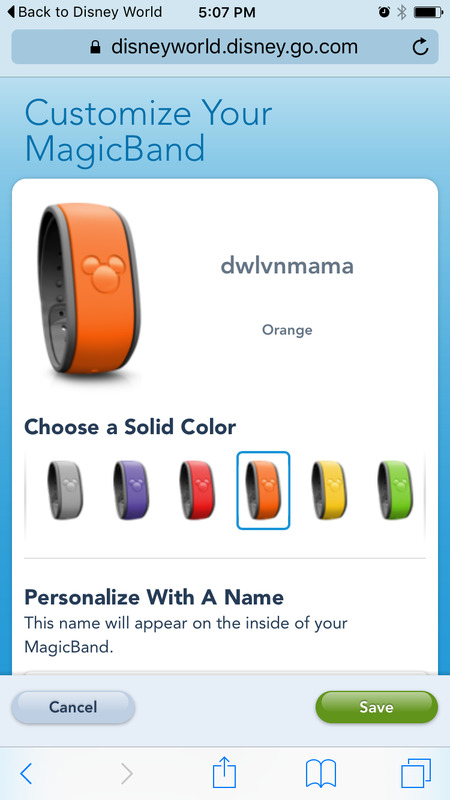 You may personalize your MagicBand in your My Disney Experience account. This is easier to do on a computer. For more information of the process please watch my video MagicBand Video. 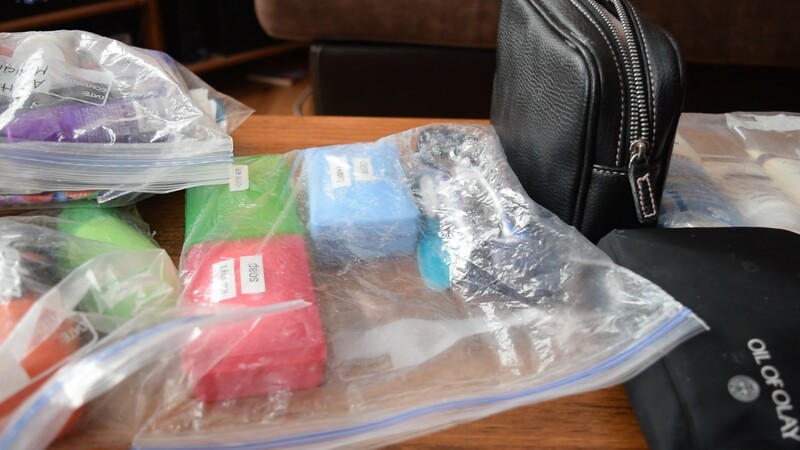 In the box will be your MagicBands, luggage tags and information on the MagicBands. On the right side of the box will be a tag that says "Pull Here Luggage Tags". 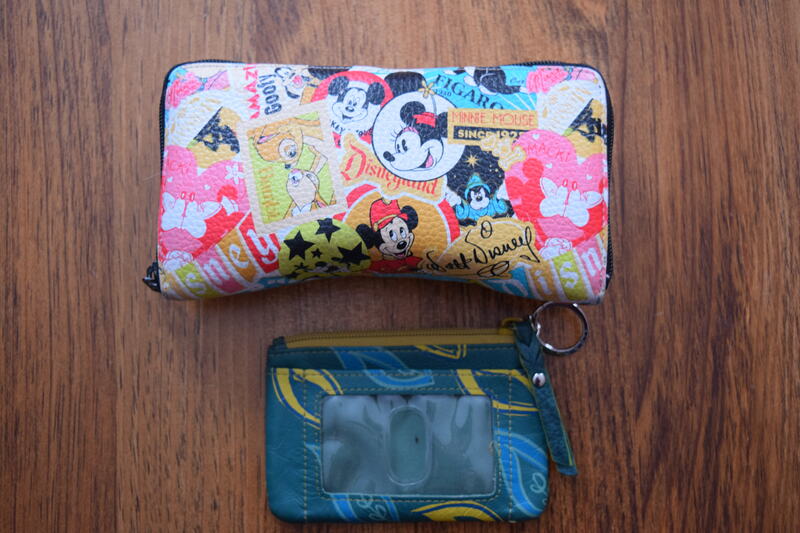 The luggage tags will be underneath the MagicBands and the correspond to the color of your MagicBand. Also underneath your Magic Bands you will find information on how your MagicBands may be used, as mentioned above. This is the last piece of Mickey Mail you will receive before your vacation. After this mail, all you have to do is pack and have a magical vacation. Recently I had the wonderful opportunity to travel to London to see Harry Potter and the Cursed Child. The play was incredible and London was beautiful, I can not wait to go back. However the trip was very short, four days to be exact. Our plane departed on Wednesday night, landing in England on Thursday morning, with the time change. Then we departed England on Saturday afternoon. The play is in two parts, Thursday night and Friday night. So we toured Thursday afternoon and all day Friday. Thankfully this trip was adults only, I don't think the kids could have lasted. They would have been exhausted. 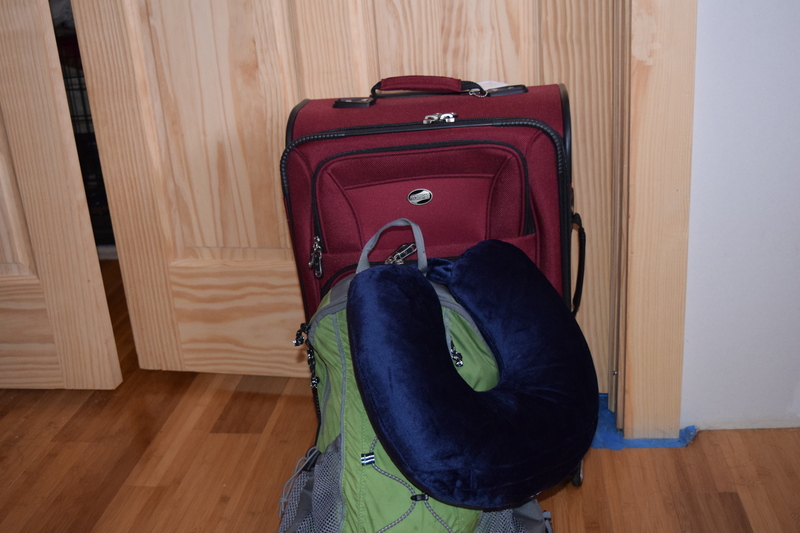 Because it was such a short trip, we decided to pack a carry on bag and a backpack each. 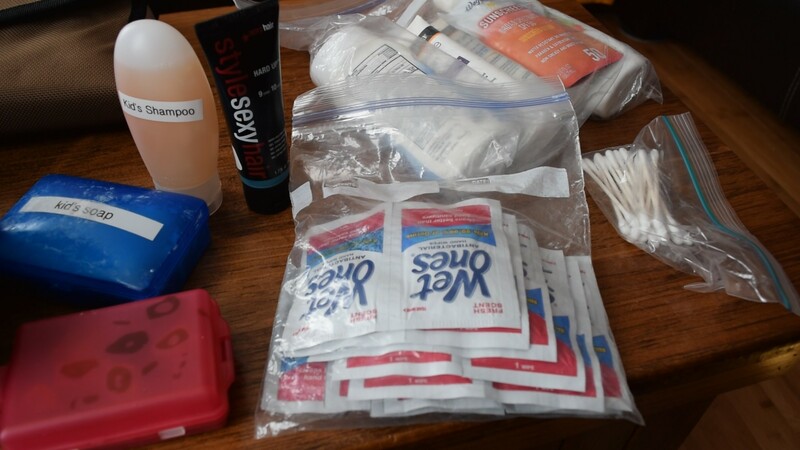 The liquids were in a quart size bag and while traveling were kept in the front pocket of the suitcase. to store my makeup, hairbrushes and any odds and ends so the sink area is not cluttered. Next up tolietries for adults. You will notice I bagged everything in gallon size Ziploc bags. 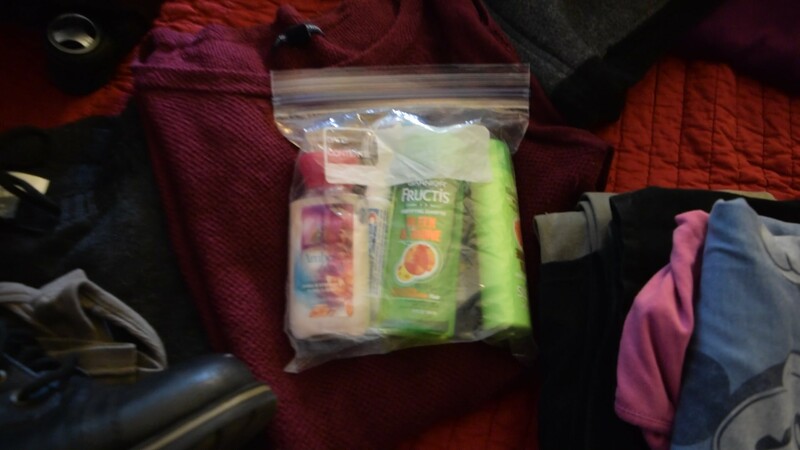 This was not only to prevent something from leaking all over the inside of the bag but also on our check out day, everything from the shower is wet so I just pack it into the bags for the trip home, nice and easy. Just like for the kids' tolietries, the toothbrushes and toothpaste were in a hanging bag. Next up is packing for kids for a trip to Walt Disney World. 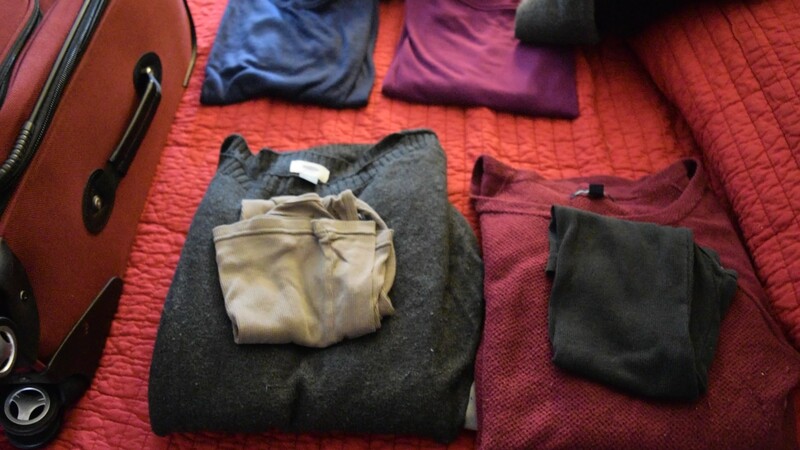 Now that my kids are bigger I pack one outfit a day for each kid, along with extra socks, underwear and pajamas. 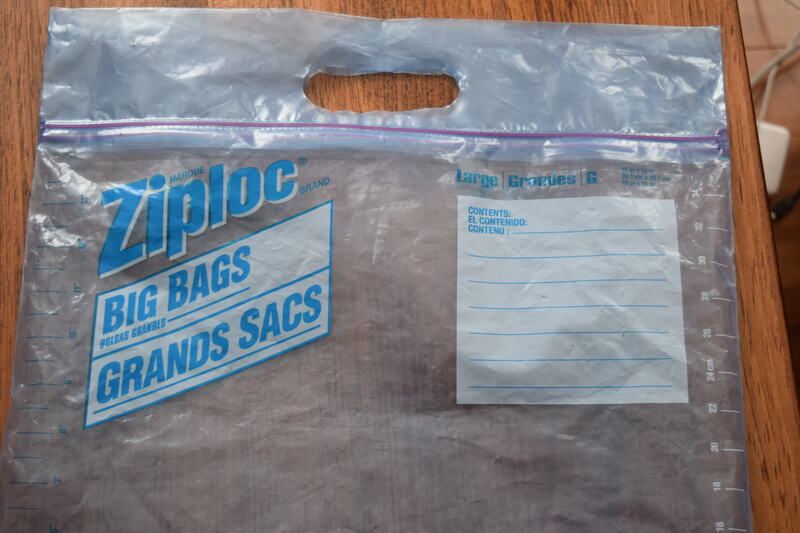 Right now my kids' clothes fit in a gallon size Ziploc bag, I fear that will not be the case for our next trip. So for this trip I labeled a gallon size Ziploc with the child's name and the day. 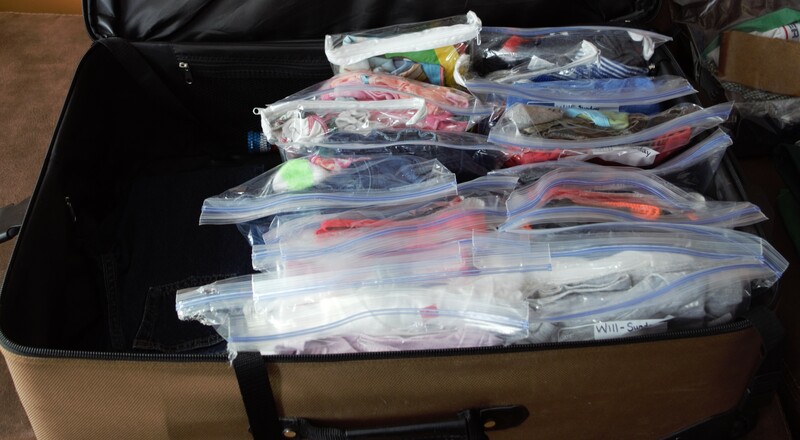 Then in each Ziploc bag there is a t-shirt, shorts, underwear and socks. At the hotel the bags are unpacked into a drawer and in the morning each child goes to the drawer pulls out their bag for the day and gets dressed. CONVENIENCE!! I LOVE IT! 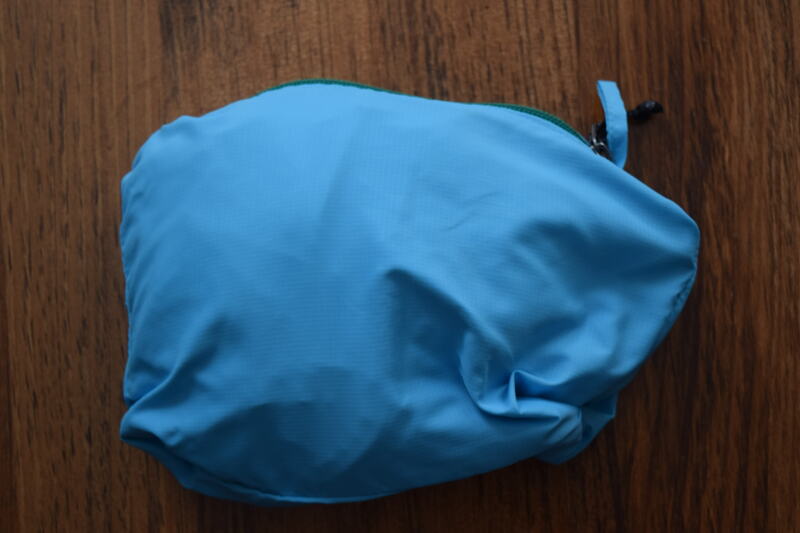 In a separate bag, actually it is a zippered bag that contains my curtains when I purchased them, I pack the extra underwear and socks. I also packed jeans and raincoats, just in case the weather changed. This happened to us once but we were traveling in January, not only did we need coats but also hats and gloves, it was very cold that trip. The kids wore their sweatshirts to the airport as it was chilly in the morning. We were thankful for the sweatshirts during our last two evenings of our vacation. Finally I packed their costumes and some odds and ends into gallon size Ziploc bags and a large size Ziploc bag. 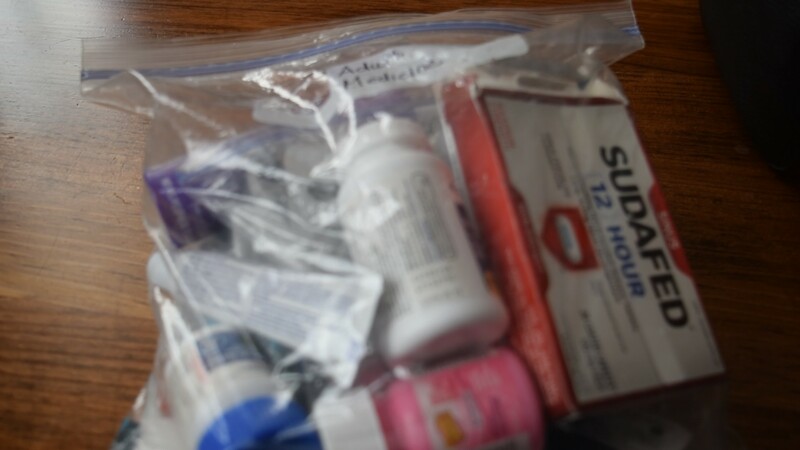 I love the bigger Ziploc bags they are great for carrying things like water shoes and towels. Then when the day is done and you are back in the hotel room, take everything out to dry and turn the bag inside out to dry as well. So easy! 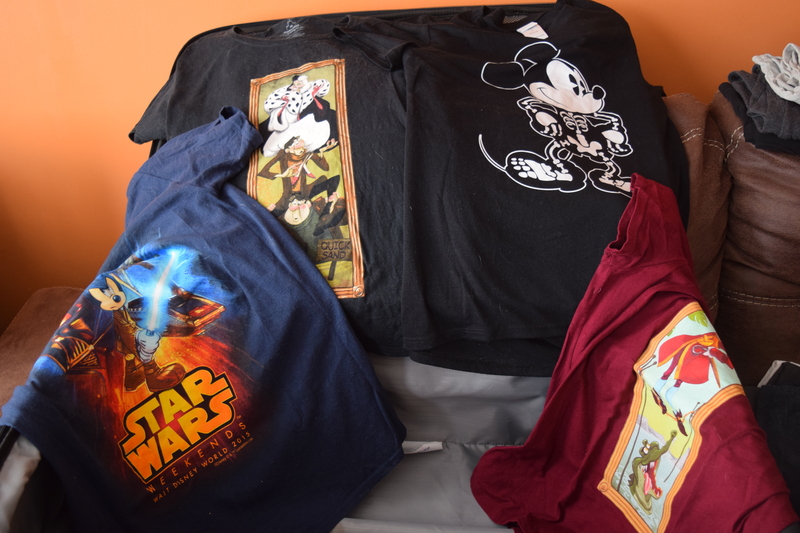 Please check out my video for more details on what I pack for the kids for a vacation to Walt Disney World.